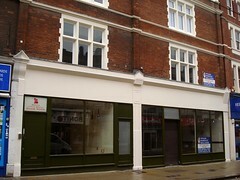 Business premises on George Street, vacant as of February 2015. Still vacant as of July 2015, January 2016, May 2016, September 2016, January 2017, March 2017, October 2017, February 2018, June 2018, and October 2018. Previously a Chinese buffet restaurant called Oriental Xpres photo, but this closed some time in the latter half of 2012. As of November 2012 there was a notice in the window photo claiming that the closure was due to the owner being on holiday, but as of February 2013 this notice remained in place and the restaurant remained closed. As of June 2013 it was still closed, and the interior had been partially stripped photo taken through window. By September 2013 it had been boarded up photo, though by the end of October 2013 the boards had come down again. According to Google Street View, as of July 2009 it was a tattoo parlour called Needle Time. Last edited 2019-01-22 18:11:40 (version 30; diff). List all versions. Page last edited 2019-01-22 18:11:40 (version 30).